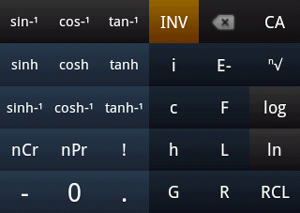 RPN Calculator uses Reverse Polish Notation. RPN uses a stack of numbers and does not require parentheses. Functions and operators are evaluated/applied as they are entered into the stack. To enter number into stack, type number using device or on-screen keyboard. Press [OK] to enter number to stack. To perform an operation, press operation's button. The function or operator is applied immediately. Operations are applied to most recent number(s) added into stack. If there are not enough numbers, operation is not performed and no error occurs. [CA] Clears every object in the stack. ↕ Swap last two objects in stack. ↓ Copy last object in stack. (-) Negate last object in stack. C/OK Clear last object in stack/Add object to stack. i Inserts imaginary unit into stack. c, h, G, F, L, R Insert constant into stack. RCL Recall number. Displays dialog that shows all user-defined variables. The topmost area is the stack. Long-click on any item in the stack to store it as a variable. 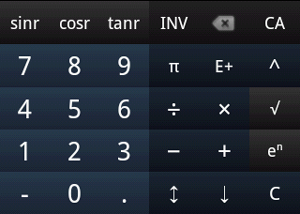 To change display mode, press [MENU] on your device and click [Fractions] or [Complex Numbers]. Then, select display mode from the resulting dialog. Fraction Mode Displays numbers as improper fractions when possible. To show list of statistical calculations for every real number in stack: press [MENU] on device and click Statistics in resulting menu. Click on one of these variables to insert it into stack. See Variables and Constants in Calculator Help. To recall a user-defined variable, press Recall [RCL] key (INV > C/OK), followed by variable in list that appears. To store an object into a user-defined variable: long press object in stack, then select variable in resulting menu. See Preferences in Calculator Help. See Errors in Calculator Help. If an error occurs during an operation, an error is added to the stack. No more operations may be performed until either the stack or the error is cleared with [CA] or [C].